Despite the fact that it is often overlooked, providing students with a localized viewer experience is a significant step in the right direction for training organizations wishing to gain a competitive advantage. Expand your global reach to non-English speaking countries. Remember, English is “only” the third largest language by a number of native speakers, after Mandarin Chinese and Spanish. Being able to navigate, understand, and interact with the instructor in their native tongue automatically puts the learner in a “cultural comfort zone,” enabling them to concentrate better on the content you are delivering. Every additional language added to your training offering has the potential to increase sales. Think bottom line when you add two, even three, languages to your global training offering. Gain a step up on competitors. In today’s competitive environment, multilingual solutions give you the opportunity to effectively target new markets and provide training on your products and services to a much amplified and diversified audience. Think of the business advantage in reaching these new markets ahead of your competition. In the past year, CloudShare clients delivered over 10,600 classes worldwide via our global data centers. Our customers rely on us both for our technical expertise in providing cloud-based training labs for software and IT training, as well as our ability to provide specialized features to support their business goals. In this light, this week we’ve released our new multi-lingual environment viewer to better support our customers’ global training and sales initiatives. The viewer localization option is now available in German and Japanese with more languages to follow soon. 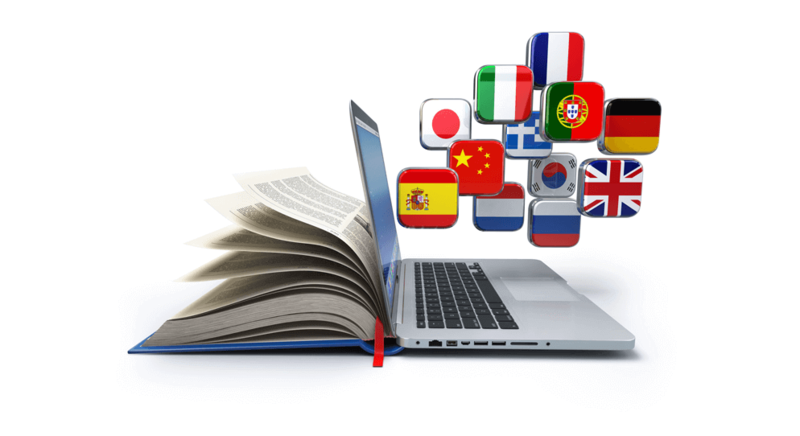 While instructors have always had the ability to reach students and prospects around the globe with CloudShare, the multilingual viewer makes it easier for learners and prospects to understand instructions and navigate in their local language. Users simply choose their language from the language button in the toolbar (see the circle in the image). The Overview page, Actions panel, and In-viewer notifications all appear in the user’s familiar tongue. Fast copy of snapshots between data centers. CloudShare’s automatic snapshot copying feature is designed not only to make this process simpler and faster, but also to ensure users always spin up the right environment. 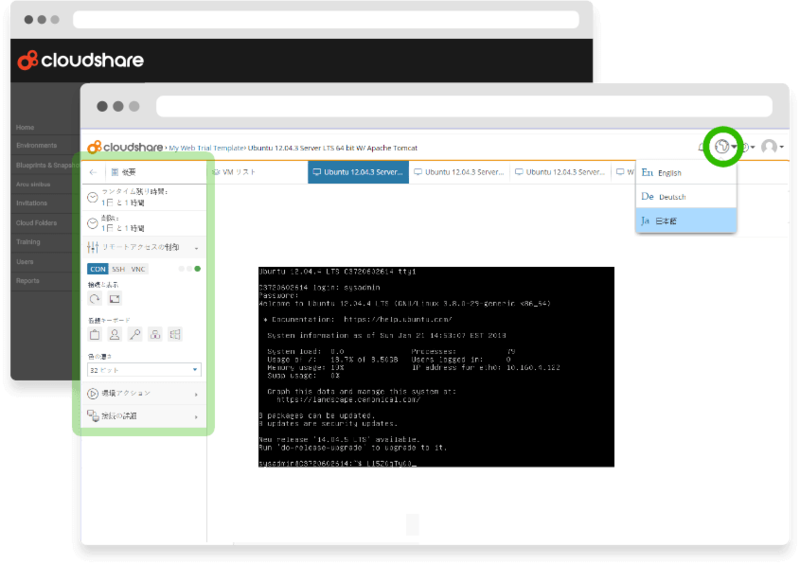 The minute you create a new snapshot in one region, CloudShare automatically identifies it and suggests copying it to other regions. With a simple click, CloudShare copies the snapshot to every region, notifying you every step of the way. Unfortunately, sometimes students around the world experience latency issues. Now, you are able to test and help them achieve the optimal VM viewing experience. The test recommends solutions to help fix any connection issues and automatically suggests the right adjustment for optimal performance-quality balance. If you’re in the business of boosting your organization’s success, going local is the key. By speaking your students’ and prospects’ language, not only are you able to communicate better, you are able to form stronger bonds. There’s no need to wait. Localization is scalable. Start with one additional language and then another. First with your training environment, your trainers, and then your images and product. And remember – to create a fully optimized local experience, you must understand your users’ culture as well. Wishing you happy localizing!